Gearing up for the competitions! We hope students from around the region are hard at work, checking out campus maker spaces, talking to their potential customers, and testing and modifying their prototypes, as they set themselves up for the 2019 Buerk Center for Entrepreneurship competitions. The competitions are open to all college students, grads and undergrads, across the Pacific Northwest. On the UW Seattle campus we are hosting a number of workshops and team formation nights where speakers talk about design thinking, maker space equipment available to students, how to do market validation, customer discovery and more. We also have students who have gone through the competitions in past years come back to share their experiences. All of this helps this year’s cohort of students learn what the competitions are all about so they will get excited about jumping in and bringing a project of their own into the mix. How do you tap in to all of this wealth of information? Join our social media channels where video highlights will be shared over the next few months. Learn more about the 2018 final Hollomon Health Innovation Challenge event and get all the details for this year’s competition at HIC.WASHINGTON. EDU. Why do students enter the competition? Connections to industry experts, a place to share the vision for their product with a large audience, prizes and more. It’s an experience not to be missed! Are you up for taking on a big challenge in the environmental field? Learn more about student teams that did just that in the 2018 Alaska Airlines Environmental Innovation Challenge and took away big prizes and valuable advice from the 200+ judges who were present. Get all the details on how to enter this year at EIC.WASHINGTON.EDU and get ready for the experience of a lifetime! 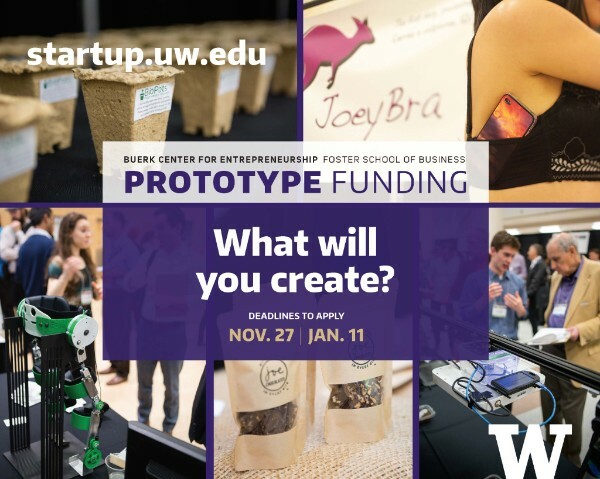 The UW Business Plan Competition is the big finale of the competition series! More than 80 teams from around the region enter, bringing all sorts of ideas ranging from food products to tech products. This is a multi-round competition with 36 advancing teams moving from the Screening Round to the “Investment Round,” then 16 of those go on to the “Sweet Sixteen Coaching Round,” and only 4 of those move on to the “Final Four.” Three of those impressive teams will be the final winners. It’s a crazy, energetic process, that brings incredible teams and products to the point they can have a real, positive impact on the world.